Wettest December in Los Angeles in 121 Years! Rain New Year's Weekend? December 25, 2010 at 8:00 p.m. The strong cold front that swept through Southern California Christmas night resulted in 0.90 inch of rain at Downtown Los Angeles (USC), increasing December's rainfall total to 9.67 inches. This makes December 2010 the wettest December in 121 years (since 1889), and the second wettest December since recordkeeping began in 1877. Rainfall totals from last night's fast moving front generally ranged from about 0.4 inch to 0.9 inch. Here's an archived copy of a Precipitation Summary from the NWS Los Angeles/Oxnard with some rainfall totals from around the area. This morning's model runs continue to forecast more rain for Wednesday. The 12z NAM projects about 0.5 inch at LAX during the day Wednesday. The 09z SREF puts the probability of more than 0.25 inch of rain in the Los Angeles area at about 50% for the 24 hour period ending 4:00 p.m. Wednesday afternoon. Depending on how much rain we get Wednesday, for the first six months of the 2010-11 water year (July 1 to December 31), the rainfall total for Downtown Los Angeles will likely rank as the fourth or fifth wettest in the 133 years that records have been kept. In the medium range outlook, the 12z GFS and 12z ECMWF differ in how they handle an upper level low that they forecast to develop off the California coast New Year's morning. The 12z GFS is quite wet New Year's weekend, but it's too early to put much credence in that forecast. We'll see! Southland Records Astronomic Rainfall Totals in Historic 7-Day Rain Event! December 2010 Already One of the Wettest on Record. For 90 Days Ending December 23, 2010 at 4:00 a.m.
After producing phenomenal rainfall totals in Southern California and snowfall totals in the higher elevations of the Sierra, the Pacific low and trough responsible for days and days of wet weather has finally moved east. 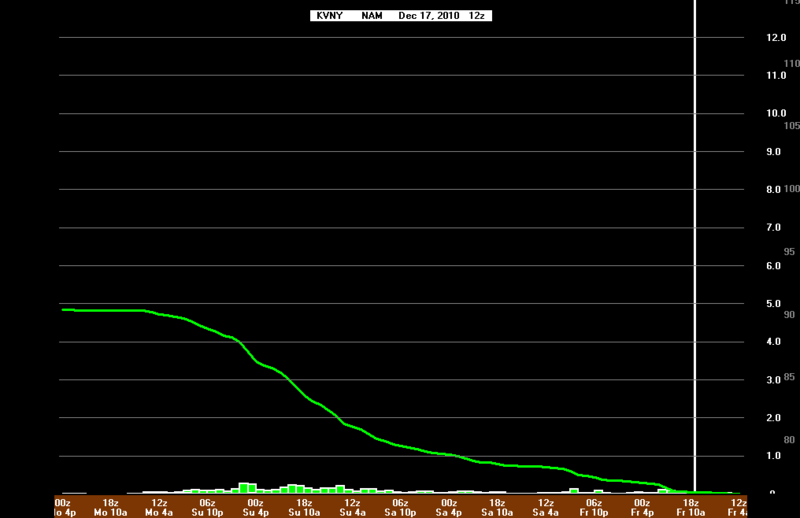 Some stations recorded more rain in the last 7 days that would normally be recorded over an entire year. Precipitation amounts over 10 inches were common, and several stations recorded over 20 inches. Tanbark, in the San Gabriel Mountains recorded 24.7 inches, NF Matilija in the Ventura Mountains recorded 24.09 inches, and Lytle Creek in the San Bernardino Mountains recorded an astonishing 26.35 inches! 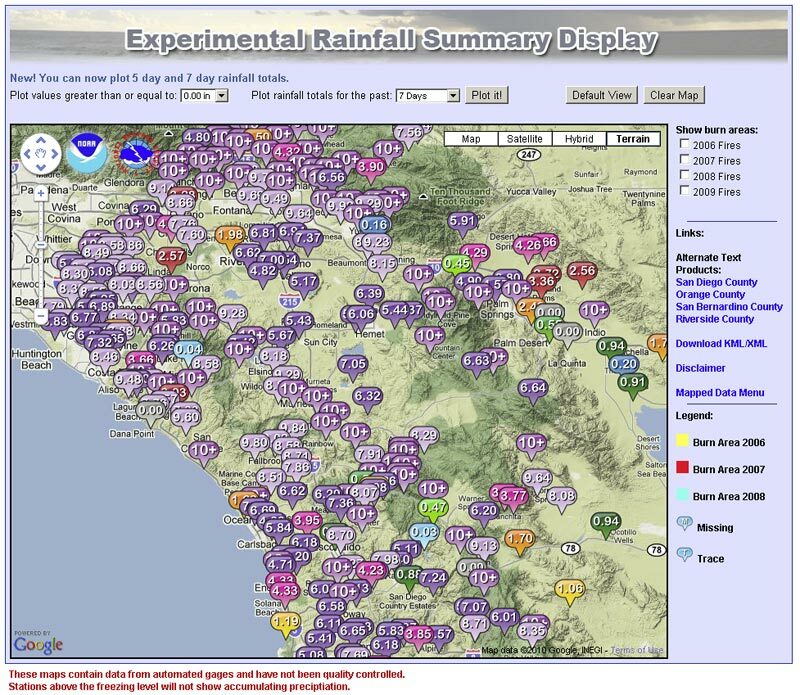 Here's are snapshots of provisional 7-day rainfall totals in Ventura County and 7-day rainfall totals in Los Angeles County from the Ventura County Watershed Protection District ALERT Map Viewer; and a snapshot of provisional 7-day rainfall totals from the NWS San Diego's Experimental Rainfall Summary Display. And here are archived copies of NWS precipitation summaries with preliminary rainfall totals from the NWS Los Angeles/Oxnard and NWS San Diego offices. 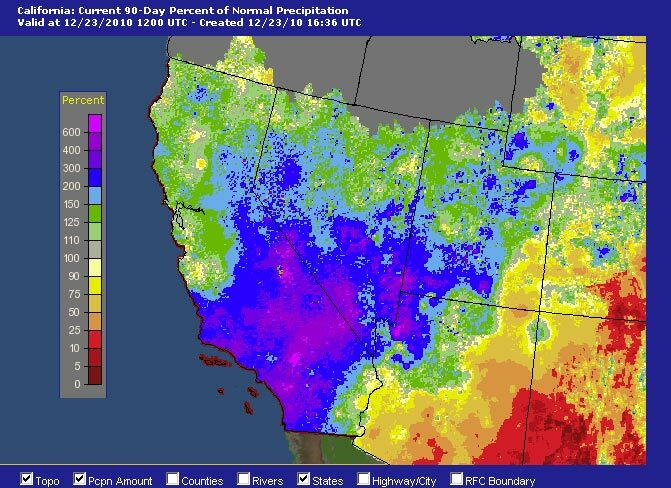 The remarkable amount of rainfall makes December 2010 one of the wettest on record in Southern California. 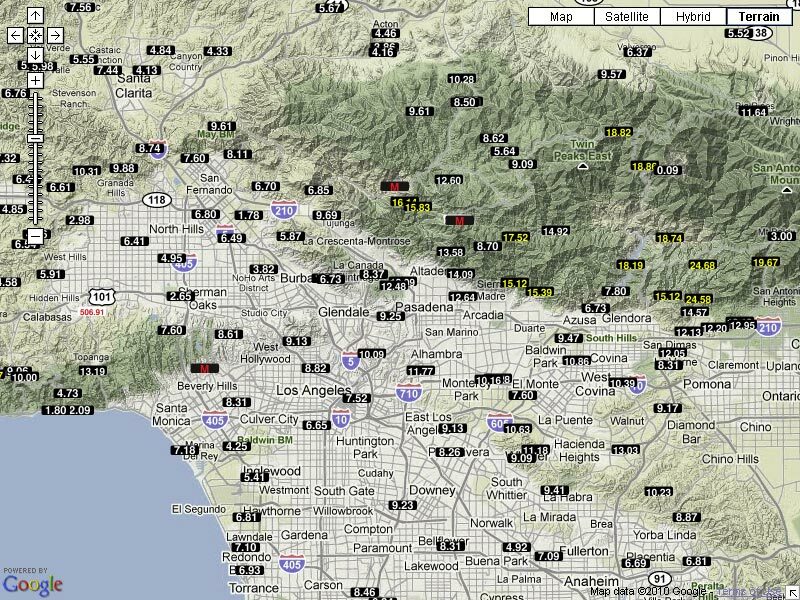 According to preliminary NWS data Downtown Los Angeles (USC) has recorded 8.52 inches of rain so far this December. This ranks it as the third wettest December in Los Angeles since recordkeeping began in 1877, exceeded only by December 1889 (15.8 inches) and December 2004 (8.77 inches). With additional rain a possibility, December 2010 only needs 0.25 inch to surpass 2004. For more detailed info see "A Look at the Record-Breaking Week of Rainfall" a PDF from the NWS Los Angeles/Oxnard. The Sierra recorded gargantuan snowfall totals, with some of the largest being in the Southern Sierra. In the last week the snow sensor at Farewell Gap recorded 22.6 inches snow water equivalent, which roughly translates to 18 feet of snow. This morning California Cooperative Snow Surveys reports the Southern Section Sierra snowpack at 287% of normal, and the snowpack overall in the Sierra at 207%! Mammoth Mountain reports 167 inches of snow so far this December, a new record for the period 1968 to date, obliterating the records set in 1971 (139.8 inches) and 2002 (134.4 inches). As of yesterday Downtown Los Angeles (USC) rainfall was a whopping 6.88 inches above normal for the water year. That puts us way, way ahead of what is typical for a La Nina influenced rain season -- at least for a couple of months. Update December 24, 2010. Looks like there will be two opportunities before the end of December for Downtown Los Angeles (USC) to increase its rainfall total for the month and become the second wettest December since recordkeeping began in 1877. The first chance is Saturday night. For the 24 hour period ending 10:00 a.m. Sunday, the 09z SREF puts the probability of more than 0.25 inch of precipitation in the Los Angeles area at about 70%. The WRF ensembles precipitation forecast for LAX for Saturday night ranges from a low of about 0.25 inch to a high of about 0.7 inch. 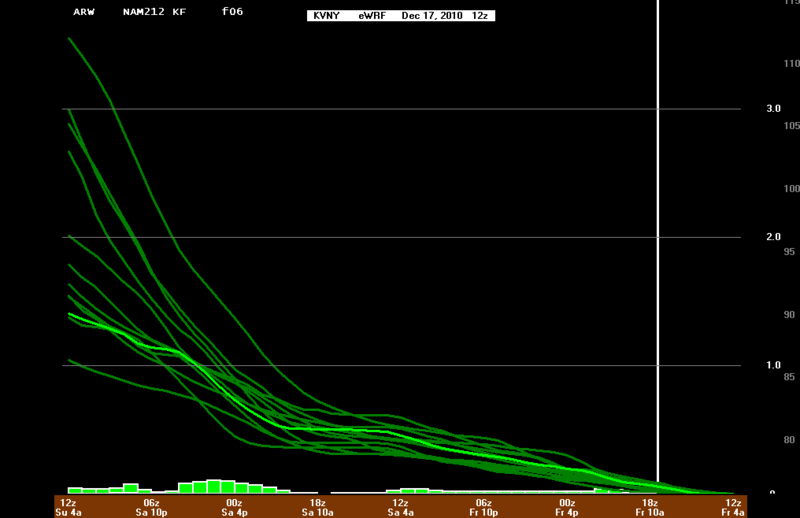 The 18z GFS says the second opportunity will be Wednesday, and forecasts a little under an inch of rain at LAX. We'll see! HPC Forecasts Up To 8 Inches Rain Locally, 14 Inches SWE in Sierra, Over Next 5 Days! For the 5 Day Period Ending December 22, 2010 at 4:00 a.m. If current precipitation forecasts and outlooks validate, December 2010 could become one of the wettest on record in California, and at the higher elevations of the Sierra, one of the most snowy. This morning's 5-day precipitation forecast from the Hydrometeorological Prediction Center, for the 5-day period ending early Wednesday morning, indicates up to 7.9 inches of precipitation locally, and 14.7 inches (water equivalent) in the Sierra. And additional precipitation is forecast beyond the 5 day period. 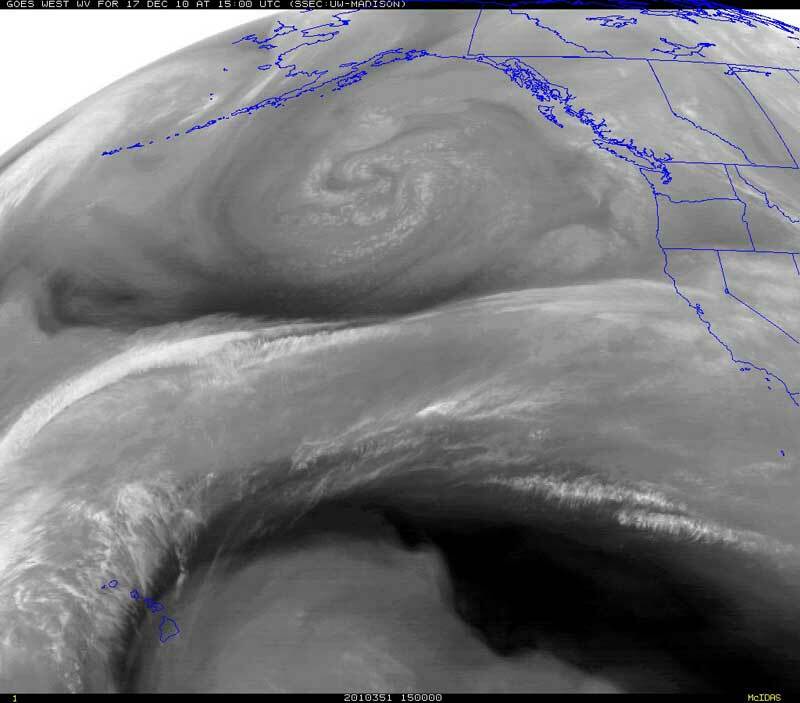 A large Pacific low working in concert with a low west of Hawaii has established a tropical connection, and is pumping copious amounts of moisture into California. 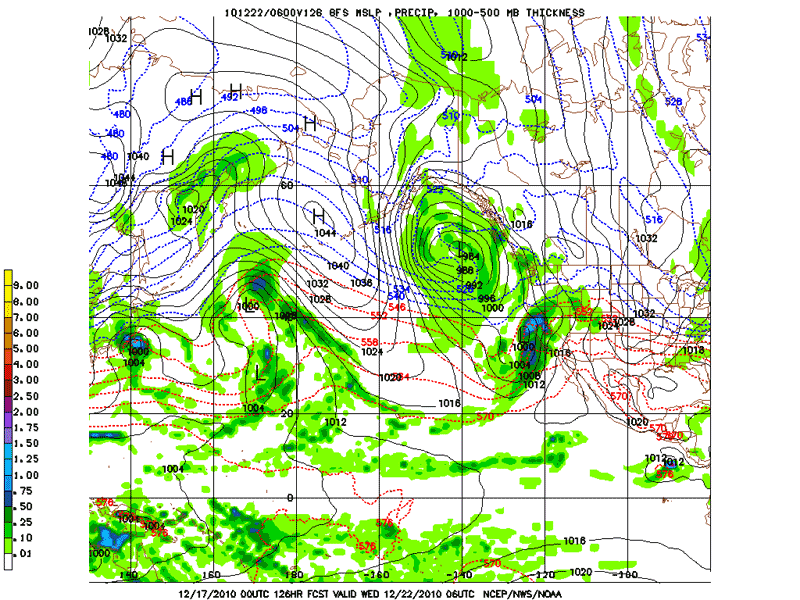 This tropical moisture conveyor belt scenario is currently forecast to continue into next week. 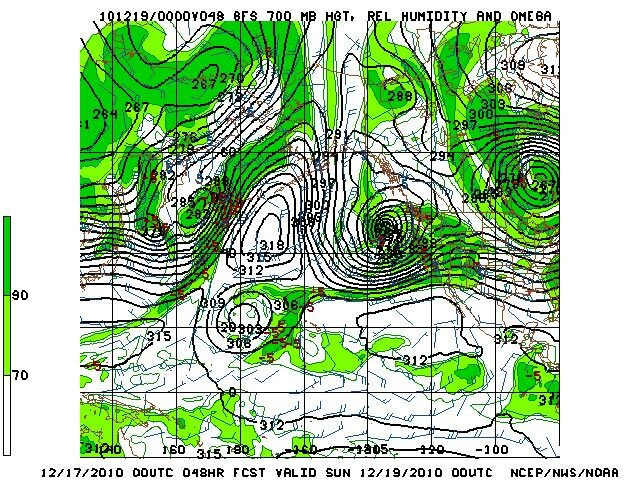 Late Sunday, shortwave impulses dig down into the low and elongate it southwestward, creating a large longwave trough. This northern part of this trough is forecast to evolve into another large upper and surface low in the northeastern Pacific. The southern part of the trough is forecast to develop a surface low and front that moves into Southern California Tuesday into Wednesday. In the short term, BUFKIT analysis of WRF ensemble data for Van Nuys shows precipitation totals through early Sunday morning ranging from about 1.0 inch up to about 3.5 inches. Analysis of 12z NAM data for Van Nuys produces around 1.8 inches through early Sunday morning and nearly 5 inches through early Monday morning. 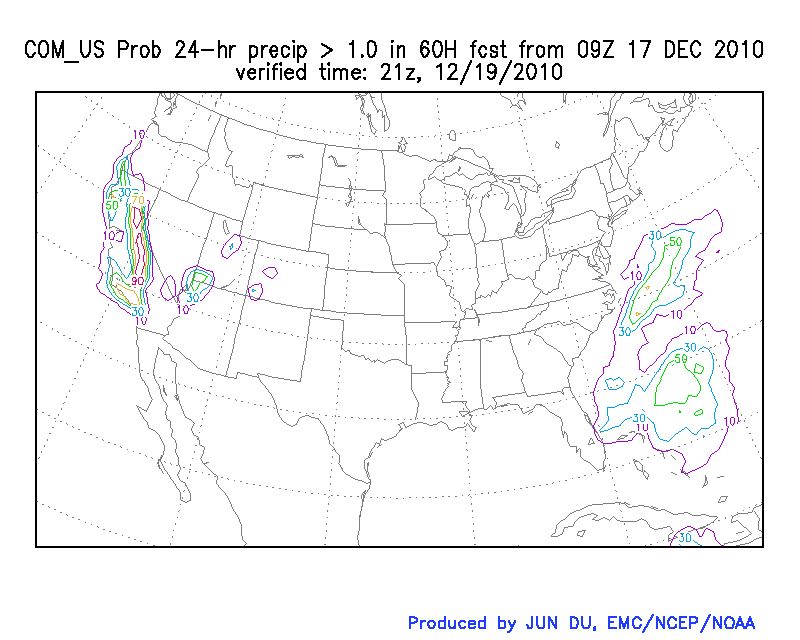 The 09z SREF pegs the probability of more than 1.0 inch of precipitation in Los Angeles area at around 70%. Precipitable water values of over 1.0 inch, high relative humidity, and a strong south to southwesterly inflow of over 30 knots should produce significantly enhanced precipitation on favored slopes -- generally those with a south to southwest aspect. It's a little early to put much credence in forecasts for next week, other than more rain appears likely. The 06z GFS produced astronomic precipitation totals mid-week -- several inches more than either yesterday afternoon's 00z run (2.75 inches), or this morning's 12z run (4.6 inches). We'll see! As of yesterday Downtown Los Angeles (USC) rainfall was 0.91 inch below normal for the water year, and much of Southern California was falling behind in the rainfall department. It looks like by next week we'll be ahead of the La Nina game again, perhaps way ahead.